Ecoprecarity: Vulnerable Lives in Literature and Culture　presents an examination of ecoprecarity - the　precarious　lives that　humans　lead in the process and event of ecological disaster, and the increasing precarious state of the environment itself as a result of human interventions - in contemporary literary-cultural texts. It studies the representation of 'invasion narratives' of the human body and the earth by alien life forms, the ecodystopian vision that informs much environmental thought in popular cultures, the states of ontological integrity and genetic belonging in the age of cloning, xenotransplantation and biotechnology's 'capitalisation' of life itself, and the construction of the 'wild' in these texts. It pays attention to the ecological uncanny and the monstrous that haunts ecodystopias and forms of natureculture that emerge in the bioeconomies since the late twentieth century. Pramod K. Nayar teaches at the Dept. of English, the University of Hyderabad, India. Among his most recent books are Brand Postcolonial: 'Third World' Texts and the Global (de Gruyter 2018), The Extreme in Contemporary Culture (Rowman and Littlefield, 2017), Human Rights and Literature (Palgrave-Macmillan, 2016), and The Indian Graphic Novel (Routledge 2016). Since the dawn of human artistic and cultural expression, the natural world and our complex and often vexed relationships with the other-than-human have been essential themes in such expression. This series seeks to offer an encompassing approach to literary explorations of environmental experiences and ideas, reaching from the earliest known literatures to the twenty-first century and accounting for vernacular approaches throughout the world. 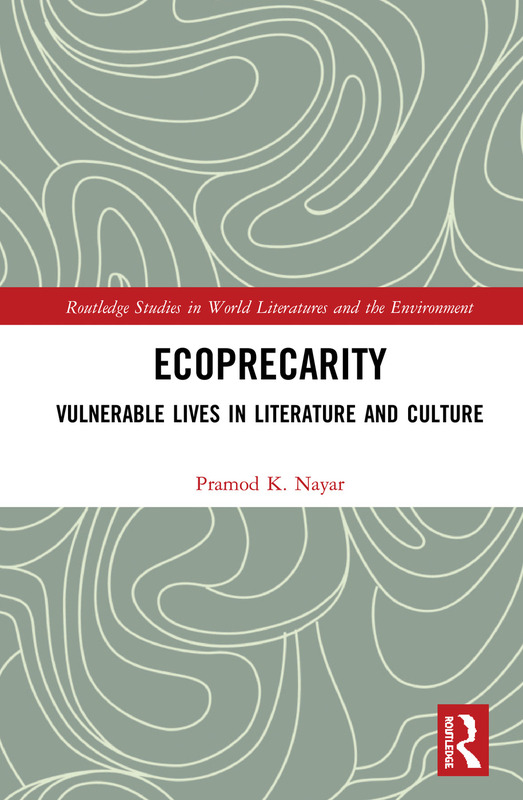 In recent decades, it has become clear that highly localized, non-Western forms of literary expression and scholarly analysis have much to contribute to ecocritical understanding—such studies, as well as examinations of European and North American literatures, are encouraged. Comparative treatments of literary works from different cultures, cultural expression in various media (including literature and connections with visual and performing arts, ecocinema, music, videogames, and material culture), and interdisciplinary scholarly methodologies would be ideal contributions to the series. What are the lessons regarding human-animal kinship that can be gleaned from indigenous songs in Africa, Amazonia, Oceania, the Americas, and other regions of the world? Which discourses of toxicity in the urban centers of contemporary East Asia and the post-industrial brownscapes of Europe and America might gain traction as we seek to balance human and ecological health and robust economies? What are some of the Third World expressions of postcolonial ecocriticism, posthumanism, material ecocriticism, gender-based ecocriticism, ecopoetics, and other avant-garde trends? How do basic concepts such as "wilderness" or "animal rights" or "pollution" find expression in diverse environmental voices and become imbricated with questions of caste, class, gender, politics, and ethnicity? The global circulation of culturally diverse texts provides resources for understanding and engaging with the environmental crisis. This series aims to provide a home for projects demonstrating both traditional and experimental approaches in environmental literary studies.